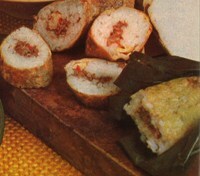 This stuffed rolls recipe with Rice with ground beef or ground chicken as a stuffing maybe a good idea if you want to go to the picnic or going for a day out somewhere and looking for some ground beef recipes that easy to carry and take away. It’s easy to make and you make it a day before you going. It is delicious cold or warm. It doesn’t really matter. The most important thing is that you stomach wouldn’t be yelling for a food, because this stuffed rolls recipe would filled your stomach immediately, so you don’t have to look for another food or snacks that might be not good for your diet principal. So, there are a lot of advantage of this low calorie recipe beside that is easy to make and easy to take away. Put the rice and enough coconut milk to reach 5 cm above the surface of the rice in a pan. Add the bay leaves and salt. Boil and stir it until the coconut milk is absorbed by the rice. Meanwhile prepare the stuffing: heat the oil and fry the pounded shallots, garlic, chilies, galangal, bay leaf and the spice paste until fragrant. Add the ground beef and stir fry until the beef has changed color. Add the thick coconut milk and set the heat on middle fire and simmer with tip until the meat is tender and the coconut milk has been absorbed. Take a piece of banana leaf or aluminum foil. Put in 2 tablespoon of the rice, flatten it and put 2 teaspoon of the ground beef mixture on the top. Enclose the filling with another 2 tablespoon of rice. Roll the banana leaf or foil into a roll. Secure the ends tightly. Steam the rolls in a steamer for about 90 minutes. About 10 rolls, it depends how big and how long you make the rolls.